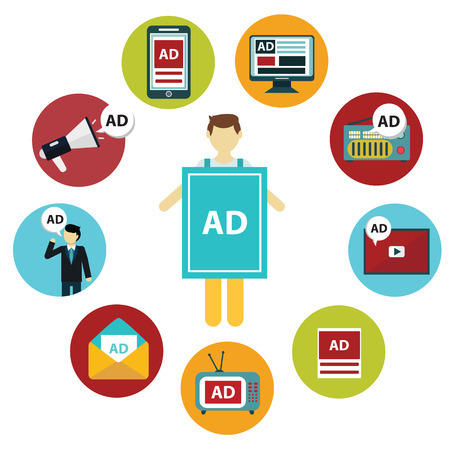 There are many types of ad formats that you can use on your website. Each type has its own advantages and disadvantages in terms of design, visitor experience, and effectiveness. Below are some forms of the most popular advertising formats and their respective pros and cons. The banner ad is the oldest and most common type of advertisement consisting of an image, which could be an animated or a static image. A text ad, also known as a text link, is an advertisement which only uses words to describe the offering. These two forms of advertisement are very basic and simple. This simplicity is what makes them so easy to design and implement. On the other hand, their simplicity and familiarity can make it more difficult to attract the attention of the internet surfers who have become immune to them. This type of rich media advertisement appears on the website in an animated fashion as if it were floating on top of the current page. Typically, such an ad contains a close button giving the visitor some flexibility, making it less intrusive than other ads. Also, in most cases, the advertisement disappears after a programmed amount of time. A more advanced floating ad actually scrolls up and down the page following the visitor’s scrolling actions. One positive thing about this type of ad is that it definitely attracts the user’s attention when it appears. Designers are able to create very attractive floating ads that result in a higher click-through rate (CTR). Due to their uninitiated appearance, visitors may find them to be unwelcome and similar to the dreaded pop-up ad described next. This format of ad appears in a new window in front of the current one. Pop-up ads have grown to be one of the most hated forms of advertising. Although they tend to aggravate visitors, certain advertisers tend to like them. They force the visitor to view them and provide higher click through rates than regular banners. Many modern browsers are able to block most pop-ups, decreasing their usefulness and effectiveness. Yet programmers keep finding ways to bypass such pop-up ad blockers. Be careful, annoying pop-up ads with flashing colors can deter visitors from returning to your website. However, there are valid pop-up ads offering a special non-deceiving promotion. In these scenarios, they can prove to be very favorable and effective. This type of ad increases in size following a user-initiated action which is usually a mouse-over or a mouse click. They can also be set to expand and contract automatically after a certain pre-determined amount of time. One advantage of this expandable ad format is that it takes up less space on your website in its smaller state. Furthermore, once the creative has expanded, it provides a large area to deliver the intended advertising message. Another advantage, in the case of the action-driven expansion, is that you can measure how many times visitors expanded the ad and even the amount of time the ad is expanded providing valuable feedback. If the expansion is time-driven, it can be distracting to the visitor who was looking elsewhere on your website and can feel bothered by the advertisement. Such an advertisement appears as a full page before the visitor reaches their expected content page. The advertisement can be of any type such as: a simple banner, rich-media, or a video. Typically, a frequency cap (eg: once every 24 hours) is set for this type of ad so that visitors do not have to encounter it every time they visit the page. The way the ad surprises the visitor, who was expecting to reach the content page, causes a highly visual impact. Because it is clearly seen, an interstitial ad can be very effective. On the negative side, this ad type stops the visitor from going directly to their desired page and can hence be perceived as aggravating. This type of ad displays a small "peel" on a corner of the website. A visitor can opt to view the entire advertisement by moving the mouse over the peel. The full ad begins to display in an animated fashion as if a page was being peeled. The great thing about peeling ads is that they intrigue the visitor but do not force them to view the ad like a pop-up does. This non-intrusive form of advertisement also takes up a very small, typically unused, amount of space on the website and is attractive to the eye. The clear disadvantage of peeling ads is that if the visitor never moves over the peel, either because it is overlooked or purposely avoided, the ad will not be displayed. Some ads can be very large in size, which need a long load time. This affects the visitor’s experience on your website. Polite ads were created to tackle such problem by loading the advertisement in two phases. First, a compact image is loaded and displayed with very little delay. Second, after the entire page has been loaded, the full version of the ad starts to load. This loading strategy has a clear advantage over the single load. It gives the visitor a more positive experience by allowing them to view the contents of the page without having to wait for the ad to be fully loaded. It also gives advertisers more flexibility when creating the full advertisement knowing that they do not have to worry so much about the ad size. However, this ad type requires more technical knowledge to implement. As always, we highly recommend all publishers to evaluate and offer different types of ads to your advertisers to maximize your advertising revenue. Consider your website design, content, its unused space, and load time. AdSpeed Ad Server supports all of the mentioned ad formats above, so open a free trial account with us today.